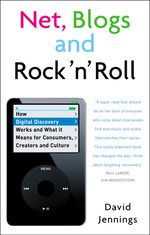 In time-honoured tradition, the final chapter of my book rounds things off by asking where we're heading with the latest wave of technology and how it may affect the prospects for renewal and development in our culture. I quote three white men of varying stripes and ages — Joe Boyd, Noel Gallagher and John Harris — who each give a different take on the "things ain't what they used to be; something has been lost" riff. Older readers will attest to the fact that 1977 was very unlike 1967: in the intervening years — and this is somewhat crude, but bear with me — psychedelia turned to prog, which was in turn avenged by punk, while glam-rock strutted about and the music industry inaugurated the age of the singer-songwriter. This year, by contrast, isn't that different from 1996: Blur and the Gallaghers are still here, the cranked-up guitar remains king, and it's still just about acceptable to walk around with a Britpop haircut (I should know — I've got one). That's right: rock is dead, or it definitely might be. One or other must be true, because Glastonbury wasn't very good. The main problem, to hear some people talk, was the preponderance of those responsible for our Great Rock Crisis: people over 30, who are apparently buying most of the tickets for great musical events, taking the kids and a hamper, and thereby ruining their essential ambience. In this era of growing abundance, we are all granted an Olympian view over the full history of recorded media. The trouble with having an Olympian view is that it means we all have the same view. I'd been a music fan for many years when I first bought an album that was recorded before I was born (Another Side of Bob Dylan). But I know 12-year-olds who are intimately familiar with everything the Small Faces and The Zombies ever did. Pop music used to have a goldfish memory, living in a perpetual present and aimed almost exclusively at a younger audience. The musicians may have been aware of influences and traditions stretching back decades, but only a few beard-stroking fans were. Of course that's 'dumb', but in that dumbness were the seeds of continuous change. Now even the fans who don't know about an artist's influences can look them up in few minutes and trace the different paths of tradition through allmusic and similar services. That access to knowledge can make it harder to innovate. Knowing the full range of what has been done before has a kind of constipating effect on creativity: everything is piled in dense layers on top of everything else. What is John Harris's solution to this quandary? Not much of one, really. He wants us oldies to listen to people our own age, among audiences of our own age. 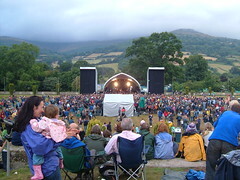 As an example he recommends the Green Man Festival (pictured above), where, as it happens, I'll be a fortnight from now, stroking my beard no doubt. Although blogs and social networks are often maligned for being a cacophony of opposing opinions, some informed and some less so, I speculate that it may the differences that emerge through these channels, together with the tensions they create and how they are articulated, that reinvigorate our culture and usher in the next wave of innovation.